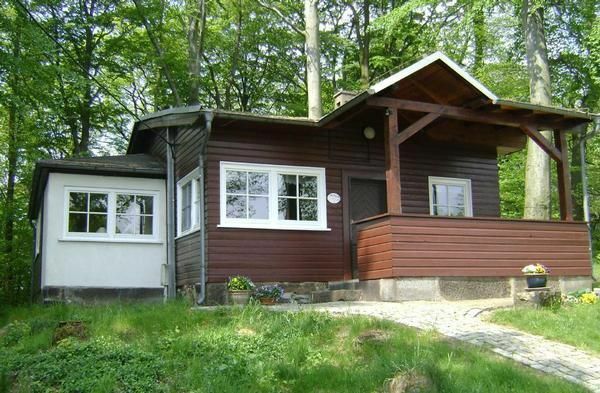 Our newly renovated holiday home (renovation 2018) is located 200 m from the village on the "Jockelsberg" (407m NN) in the midst of a fenced beech grove, surrounded by meadows and fields in Upper Lusatia. Ideal for peace-seeking nature lovers, dog lovers and families with children. There may be up to 2 dogs traveling by arrangement. The FH was classified by the German Tourism Association on 09. 11. 2016 with 3 *** (valid until 08. 11. 2019). Doctor, sauna, bakery, inn, milk and eggs from the farm just 300 meters away. Excursion destinations: Greifvolgelwarte "Oberlausitz" in the village (2 km), Sohlebad 5 km, summer model railway in Oderwitz. 10 km, Zittauer Geb. u Saxon Switzerland 35 km, 1000 years Bautzen 20 km, Görlitz 30 km, Jizera Mountains 80 km, Giant Mountains 100km. Visit the butterfly house in Jonsdorf and the dinosaur park near Bautzen. - Final cleaning: once per object costs in the amount of 25 EUR (compulsory). Village with about 600 inhabitants with Umgebindehäusern. Bakery, Cider with drinks trade, grocery store, car service, dentist, Allgemmediziner, Sauna 2 Gaststäätten in.